Weight Watchers Mexican recipes are delicious and easy to make. 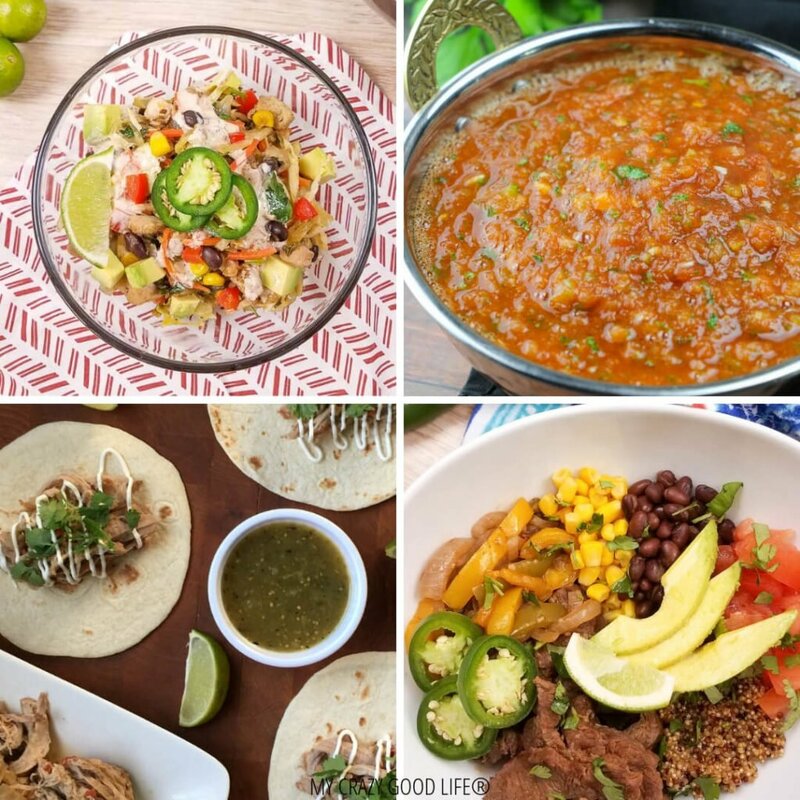 These are some of my favorite Mexican recipes with their Freestyle Smart Points included. There’s a lot of amazing recipes out there to explore. Admittedly some of my favorite recipes are Mexican favorites that I recreate to the best of my abilities with some minor adaptations to make them suitable for Weight Watchers. What makes these recipes Weight Watchers approved? The great thing about Weight Watchers is that there’s pretty much nothing that is off limits in terms of ingredients. Every ingredient has a point value and a serving size. It’s up to use to track everything that we eat so that the program can do its job! 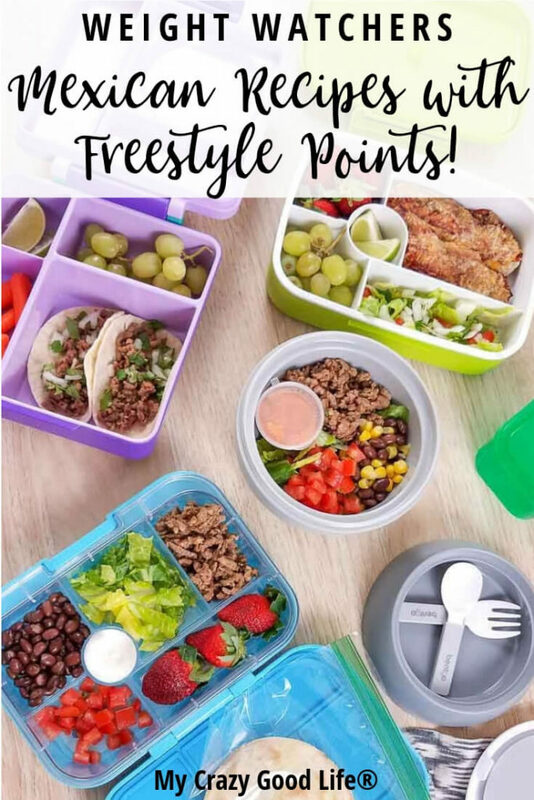 Are these recipes for the Freestyle Smart Points program? Yes! 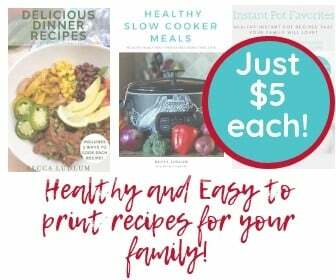 All of these recipes have been calculated for the Freestyle Smart Points version of the Weight Watchers program. Over the years there have been a few different versions of the program so it’s important when we are tracking our points to know which version they correspond with. How do I lower the Points in these recipes? Substitute the protein for a zero point option like chicken breast! Choose a lower fat % for dairy products like yogurt, milk, cheeses, etc. Lower the amount of processed sauces by thinning them out with water or substitute them entirely for homemade alternative. Example, this homemade red enchilada sauce. Use whole fresh fruits and vegetables whenever possible. Every recipe is going to be different and call for different ingredients. These are just some general tips to help if you are looking for ways to reduce the points in any recipe. Southwest Egg Roll in a Bowl | 3 Freestyle Smart Points | Though this recipe is not specifically Mexican it is inspired but the Southwest and the flavors that are a staple here! A quick and easy dinner recipe or prep some for lunches throughout the week. Carne Asada Tostadas | 9 Freestyle Smart Points | Carne Asada Tostadas are a family favorite here. We love making them and letting everyone top them with their ideal flavors. Crockpot Pork Carnitas | 3 Freestyle Smart Points | Weight Watchers recipes like this one make it all worthwhile. These delicious pork carnitas are amazing. With just 3 Weight Watchers points per serving you can enjoy these without sacrificing any weekly points! Carne Asada Burrito Bowls | 7 Freestyle Smart Points | The chili lime dressing on these burrito bowls is amazing. I’d almost be willing to eat it on it’s own, it’s that good. These burrito bowls make a great recipe for lunches too! Everyone can build their own with the perfect amount of black beans, tomatoes, or even homemade salsa. Instant Pot Quinoa Tacos | 3 Freestyle Smart Points | These vegan tacos are amazing. I love to top them with some tomatoes salsa made at home (or store bought if I’m in a hurry). They are great for a meatless Monday or for your Vegan Meal Plan! Street Tacos | 6 Freestyle Smart Points | Street tacos are another recipe that utilizes my favorite Carne Asada recipe. Street tacos make a great quick dinner for the whole family. Instant Pot Taco Soup | 5 Freestyle Smart Points | Have you used your Instant Pot to whip up any delicious Mexican dinner recipes? If not, give this delicious taco soup recipe a try tonight. Instant Pot Salsa Chicken | 3 Freestyle Smart Points | Chicken in the Instant Pot is so quick and easy that it is just begging to be part of your next meal plan. This salsa chicken is juicy, flavorful, and packs a little spicy punch! Chicken Fajita Lettuce Wraps | 7 Freestyle Smart Points | Fajitas are a staple in our home. Everyone loves them! We make them with steak, veggies for breakfast, and even chicken! This version uses lettuce wraps to lower the points without decreasing the flavor profile. Healthy Enchilada Recipe | 7 Freestyle Smart Points | Is there anything better than a fresh pan of enchiladas?! This healthy version is amazing, perfect for dinner with leftovers for lunch, and you can customize them to your liking! Hamburger Helper with Green Chilies | 5 Freestyle Smart Points | This is a typical hamburger helper recipe with a nice little chilies kick! It’s so delicious and easy to make and I swear it only gets better after a day in the fridge (hooray for leftovers)! Chorizo and Eggs Casserole | 1 Freestyle Smart Point | Starting off the day with a warm and delicious breakfast can make all the difference! At just 1 Freestyle Smart Point per serving you can’t beat this breakfast casserole recipe. Weight Watchers Tacos | 1 Freestyle Smart Point | Tacos can be a bummer because the shells or wraps are on the high side for points. For a low point dinner I make these Weight Watchers tacos which are on a bed of veggies or use a bell pepper shell! Steak Fajita Zoodles | 6 Freestyle Smart Points | As the weather gets nicer it’s a great time to get outdoors and grill some steak for this delicious and quick dinner. Fajita Breakfast Casserole | 2 Freestyle Smart Points | This is a Mexican casserole that the entire family loves to have for breakfast. It’s nice to have something loaded with veggies and protein on the table in just a few minutes! 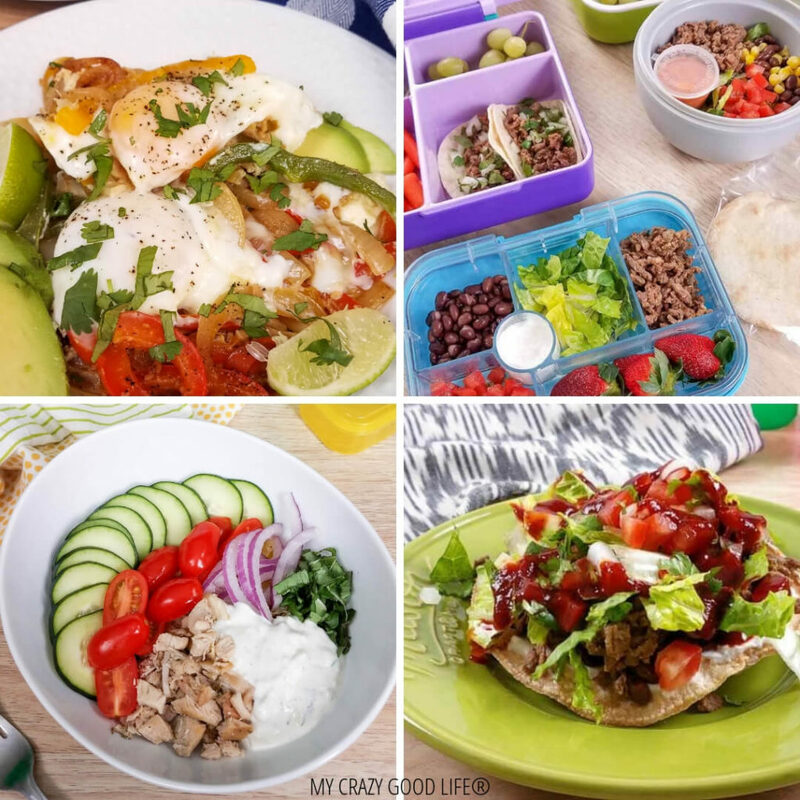 Instant Pot Burrito Bowls | 3 Freestyle Smart Points | Another version of burrito bowls that make everyone happy! We make the core ingredients and then put out all the toppings for everyone to build their perfect dinner. Weight Watchers Spanish Rice with Chicken | 1 Freestyle Smart Point | Have you tried making cauliflower rice? If not, this is the perfect recipe to get you started. It’s very forgiving and the flavors are excellent! Taco Salad in a Jar | 2 Freestyle Smart Points | If you are looking for a great way to meal prep for lunches, these taco salads in a jar are amazing and easy to make. Healthy Taco Soup | 8 Freestyle Smart Points | Keeping with our favorite flavor profile…tacos! Let’s talk about this delicious taco soup. It’s easy to make, thanks to the Instant Pot, and perfect for weeknight dinners. Southwestern Weight Watchers Goulash | 2 Freestyle Smart Points | Goulash is one of my favorite recipes. This Southwestern version is perfect for Weight Watchers thanks to all the different beans, veggies, and lean protein! Weight Watchers Fiesta Chicken | 0 Freestyle Smart Points | Looking for a free dinner recipe?! This one is excellent. It’s easy, simple ingredients, and takes no time at all to prepare!